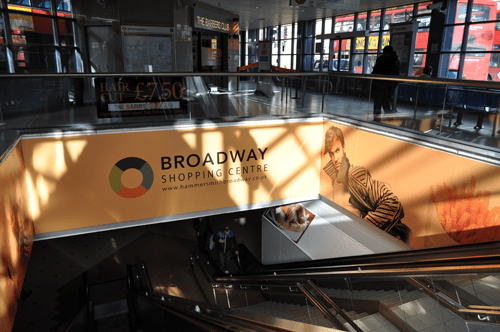 It’s said that it takes less than 10 second to create a good – or bad – impression and when it comes to retail, making a good first impression is vitally important, which is why Hammersmith Broadway Shopping Centre decided that it needed to revamp its image and create a retail environment that would help it to attract more shoppers. 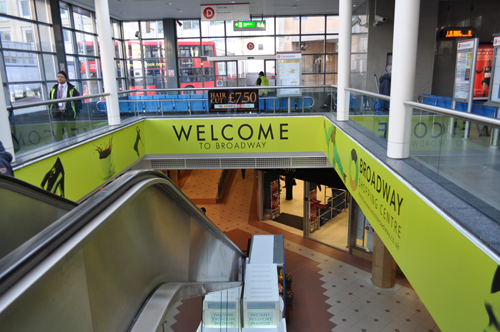 Based around the Hammersmith tube station, a central point in London, the centre enjoys a footfall of over 100 million annually, but its existing graphics looked uninspiring and ‘tired’, with the four main atriums each being covered with numerous acrylic panels bearing the brand identities of the centre’s various retail and food units. In order to brighten them up and to remind commuters what the centre has to offer, Walker Communications created an urban lifestyle theme that more accurately reflects the buzzy London street scenes surrounding the station. Signs Express (Twickenham) was commissioned to supply and install the new graphics, and, after providing advice on materials and installation requirements, it set about removing all existing signage before cladding the atriums’ recessed panels with aluminium composite sheets. It then applied over 150 sq.m of digitally printed wallpaper featuring the colourful new graphics. In addition, it also installed two 3000mm wide, slimline LED lightboxes with changeable front-loading graphics. In order to minimise disruption to the shopping centre and commuters, all work was carried out overnight between 11pm and 6am, with the whole project taking eight weeks to complete, from design, through manufacturing to installation. The end result is the fresh, bright new look that the client required.